1. Select metal type (silver or gold). 2. Select number of stones. 3. Select the stones of your choice. 4. Select the finger size. We are presenting Fabulous Fashionable Princess with Side CZ Mothers Ring. 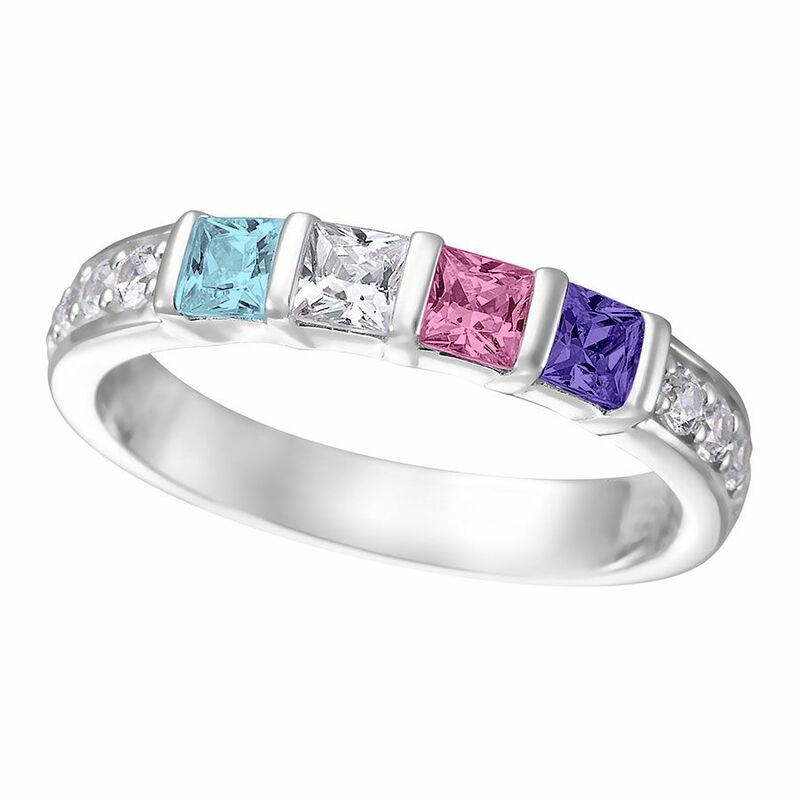 This Mother's Birthstone ring comes with your choice of 1 to 6 Princess cut Simulated or Genuine Birthstones in your choice. This beautiful Princess with side CZs Mothers ring can be customized to fit your desires. This ring is available in Sterling Silver, 10k white gold. 10k yellow gold, 10k rose gold, 14k white gold, 14K Yellow Gold, or 14K Rose Gold. Gold options allow you to select CZ or Diamond side stones as well. Each birthstone measures 3.00mm. The ring is 3.5mm Wide and 1.9mm Thick. For more information, please view the CAD image on this listing. Great Gift for Mom or any special women in your life! We Have 100% success with this Classic Beautiful Ring. Let us express our special thanks to our mommy/dearest lady who has given her life and time to make our life special. It's time to make her life and time more special and memorable. This mom ring, nana ring, is Personalized and Customized for you, with the Birthstones, gemstones of your choice. Be quick to show affection for your mother or the mother like figure in your life by giving her an amazing gift in the form of a mothers ring. This mom ring can also be a gift for your significant other especially when you are hoping to build a strong bond with her, you will find her grabbing on to it once you present it to her. The mom ring, nana ring, looks like the loveliest piece of art and gives you the thought that It is time to do something for your mother. Gift her an ultimate mothers Ring/Band where the simplicity stands out for the class and beauty of this elegant birthstone ring so artfully designed that it will almost take her breath away. A Mothers ring also symbolizes the strong bond between the two of you, it would be a form of showing your gratitude without resorting to long drawn words. Go ahead and create a vision in metal, Sterling Silver, 10k or 14k, and Gemstones only for mommy dearest. Treat yourself, mom, or nana like a queen with the gift of this Sparkling Simulated or Genuine Birthstones Ring, with your choice of Sterling Silver, 10 karat gold or 14 karat gold, in three colors, White Gold, Yellow Gold or Rose Gold. Gift her This Ultimate Princess with side CZs Mother Birthstone Ring, Mom Birthstone Ring, Mom Ring, Nana Ring, to show her that she is special and loved! Christmas Gift, Mother's Day Rings, Mother's Rings make a great gift for mom!